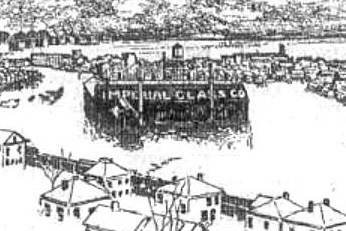 Imperial Glass Co. of Bellaire was founded in 1901 by Captain Edward Muhleman. Their early production was intaglio, pressed moulded, crystal glassware that was known as “near-cut”, because it imitated cut glass. 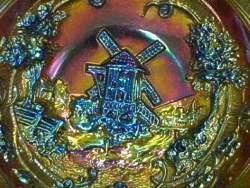 Various dates have been quoted for when Imperial started making Carnival Glass: it did not appear in the Butler Brothers wholesale catalogues until 1910, but (without proof) it was widely felt that they had introduced their Carnival Glass earlier. 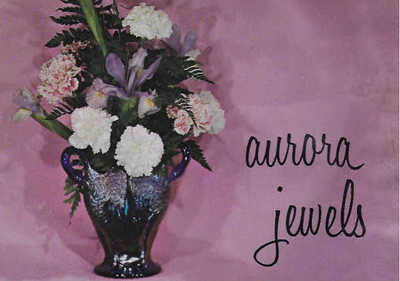 The publication “American Flint” reported in November 1909 that Imperial was working on new iridescent coloured ware, and the Imperial Glass Encyclopedia states that Imperial began marketing its iridescent glass in the Fall of 1909 (Vol II, National Imperial Glass Collectors Society, 1997). 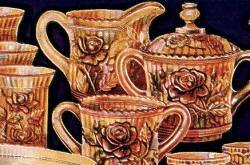 In December 1909, the Crockery and Glass Journal referred to “New items in iridescent ware from the Imperial glass company; colors are brilliant and rich” appearing in Meakin & Ridgway’s showrooms near Broadway. Our recent research has discovered this ad in the Washington Evening Star. At first glance it might seem a little nondescript, but the ad is very significant! It was hard to make out the pattern initially, but it is Imperial's “Royalty” (originally called “Imperial Crown” or Imperial's #400). The ad described the items as "plates" - it was corrected to "bowls" in later ads. The glass was described as “rubi” – and it would later be marketed as “Rubigold”. The key point is the date - the ad is from July 1908. And Royalty was not a "one-off" item as we also provide evidence that Carnival Glass was firmly "in the line" at Imperial in the early part of 1908. Read about this ground-breaking discovery. 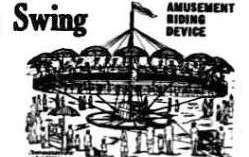 Most Carnival researchers and collectors believe that Fenton began making their Carnival in 1907, but now we know for certain that Imperial was only a little later. 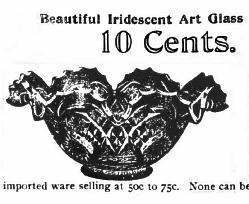 Although the first wholesale ad for iridescent Carnival Glass was for Fenton, appearing in the Butler Brothers catalogue in September 1908, Imperial got these ads in before them! Imperial's early Carnival Glass lines used several of their geometric “near-cut” patterns, as well as others in more naturalistic designs, featuring flowers or fruits. 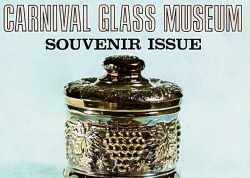 Imperial produced Classic Carnival Glass through to the late 1920s, even surviving a massive natural disaster in 1913, when there were disastrous floods in Ohio. "Read All About It" here. This magnificent coloured ad, features a marigold Imperial Fashion punch set. It is from a Lee Manufacturing catalogue supplement (dated around 1915) and it was offered as a free premium to agents selling $10 worth of Lee’s goods. "The great size of this magnificent punch set will astonish you. It consists of an extra big deep bowl with fancy scalloped edges mounted on a large massive stand with fancy scalloped base and six handled cups to match…. Bowl can be used, without stand, as a fruit or salad dish. Stand can be turned upside down and used as a flower vase or preserve dish. Handled cups can be used for serving custard, ice cream, etc. As a punch set it is truly gorgeous." 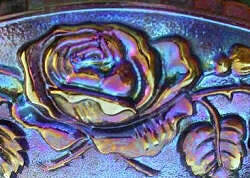 Read all about Lee Manufacturing and their use of Carnival Glass "premiums". In the USA, Imperial made much use of marketing techniques like gift assortments (sent direct from the factory), mail order and "premiums", which we explore in our new feature: "Sell it to me!" 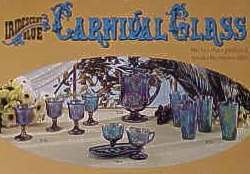 Their Classic Carnival Glass was also heavily marketed outside the USA, especially England and Australia. 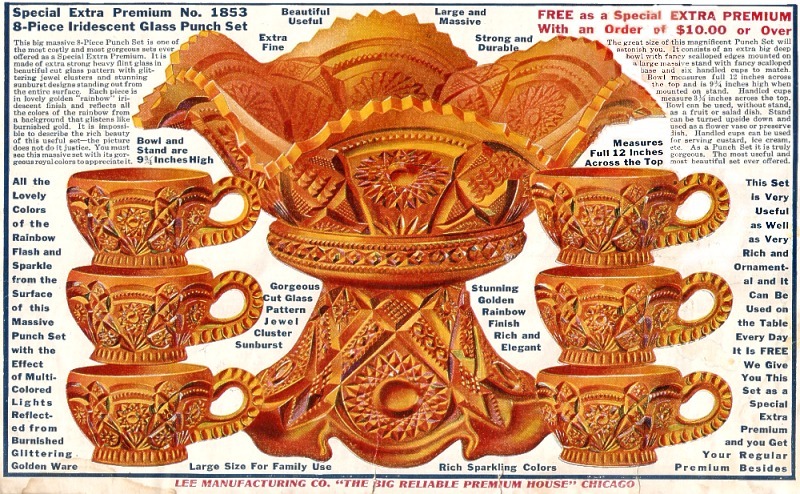 “Looks well, sells well, wears well” - a great selling line used by Markt & Co of London in an ad in the British Pottery Gazette: it illustrated an Imperial Grape water pitcher as “an entirely new line, giving good profits to all dealers. 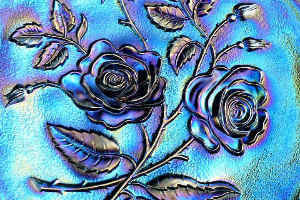 Distinctive, attractive and artistic." 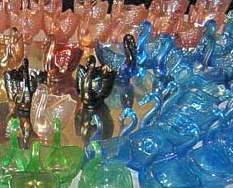 Markt, the official UK agent for Imperial’s Carnival Glass, were selling Imperial's Carnival within a year of them appearing on the US market. They advertised widely, reporting that “the new barrels of assorted 6 penny lines are proving a great success”. The price quoted is interesting: 6d. - six (old) pence for a vase or a bowl - as shown in this ad for Imperial Grape bowls. 6d. equates to around £2 (pounds) sterling or $3 US today - not as cheap as it fist seemed. 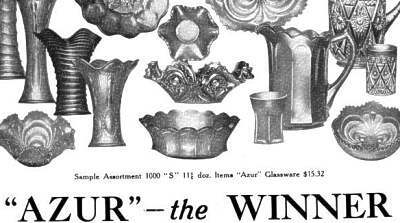 At around the same time (1911) Butler Brothers was showing the same items: Ripple vases and Imperial Grape bowls. The price quoted was 79 cents for a dozen pieces, approx. 7 cents each, a little cheaper than the UK price at the time, the difference was surely due to the cost of shipping barrels of glass across the Atlantic Ocean! Imperial's Ripple vase was one of their most productive lines, being offered from 1910 through to 1929 (and it was reissued again from the 1960s). 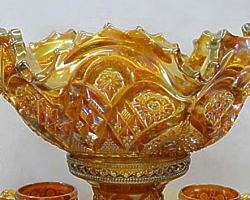 Their Classic production included helios (a metallic silver-gold light green colour unique to Imperial), purple, amber and smoke, alongside vibrant marigold, scarce vaseline, rare red and more. 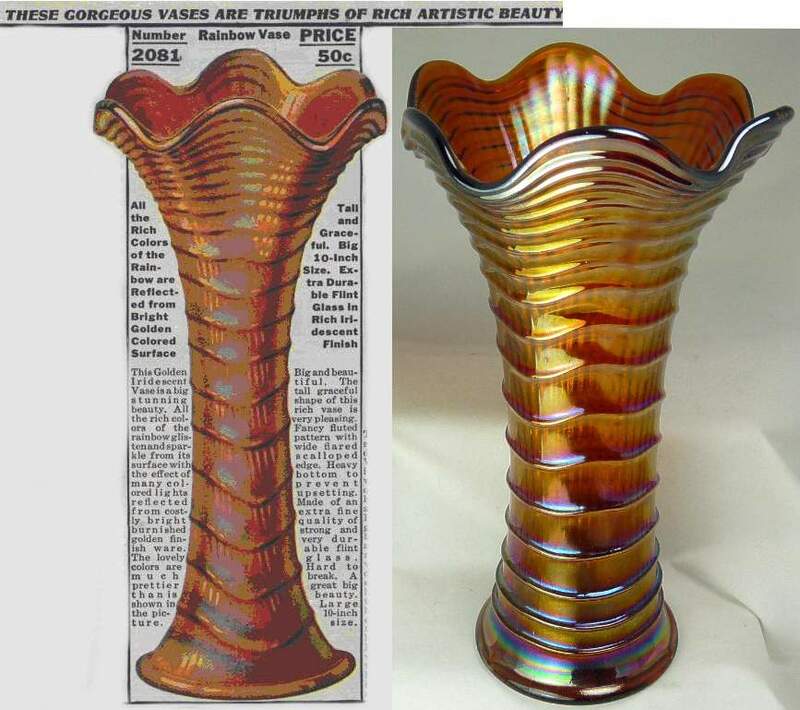 The ad, above on the right shows an amber Ripple vase in a 1915 Lee Manufacturing ad - only 50 cents! Seeing the increasing popularity of old Classic Carnival Glass, Imperial (like Fenton) decided to reissue Carnival Glass using both old and new moulds. 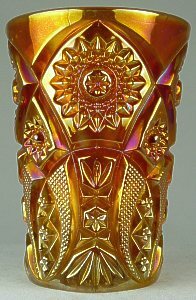 In 1962, Imperial introduced and marketed their new glass, appealing to the collectors of Classic Carnival: their ads in 1962 read: "Genuine and authentic 'Carnival Glass' American Handmade by Imperial USA. From moulds used 60 years ago." This contemporary production was marked with an impressed IG to distinguish it from their Classic Carnival production. 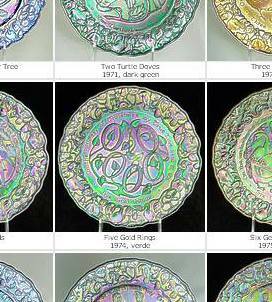 See “A Century of Carnival Glass” for details and catalogue illustrations. By the early 1970s, Imperial was badly in need of new capital. A deal was struck with Lenox Inc. and the business became Lenox Imperial Glass in 1973. The IG mark was changed to LIG. Lenox introduced new colours, such as Horizon Blue shown here, and Limited Edition production runs. Shown on the right and below is a Lenox Imperial ​Starfire bowl in Horizon Blue (pattern #42706). It is almost 10 inches across, made in Horizon Blue in 1979-80. It is a relatively rare piece, as the production run was a Limited Edition of 2,500 pieces, confirmed by a signed Certificate of Authenticity (shown here courtesy of PicClick). Above and left: Starfire bowl in Horizon Blue. ​Pictures courtesy of Louise Lethbridge. ​In 1981 the business was sold to Arthur Lorch (and the LIG mark became ALIG), but it continued to struggle financially. They finally closed in 1984. Fenton acquired several of Imperial's Classic and Contemporary moulds. The Imperial factory was finally demolished in 1995. Read and see more about Imperial - click on any image. Lee Manufacturing catalogues - sell it to me! Perry G Mason catalogues - sell it to me! 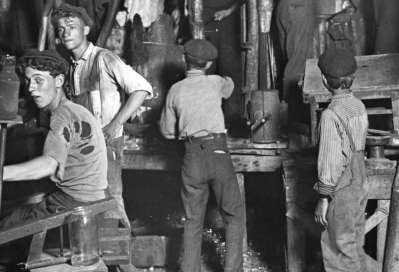 Workers wanted - training provided!